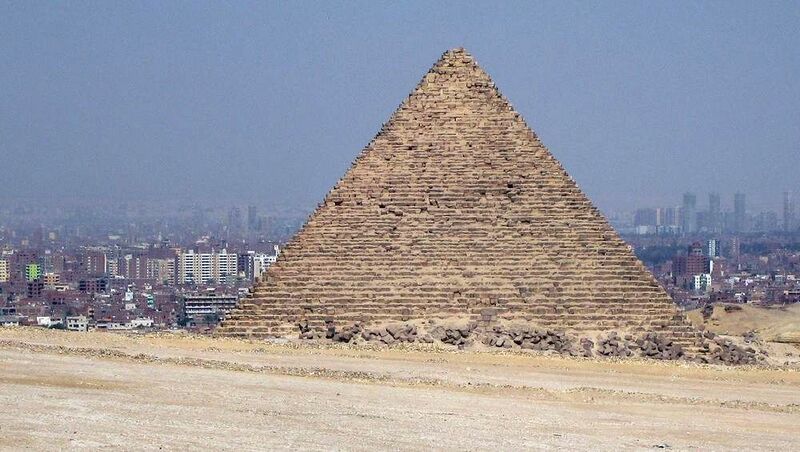 The Menkaure Pyramid is the third pyramid of the plateau of Giza. 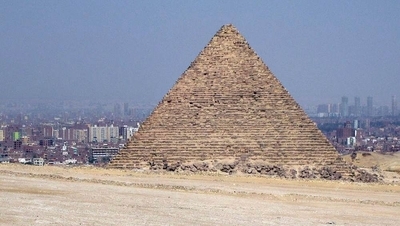 Much smaller than Khufu and Khafra, it marks the end of the era of giant pyramids. If it seems less interesting than the other two, it also introduces a number of innovative architectural elements that will be taken over by his children. This pyramid was built approximately between 2532 and 2515, during the reign of Pharaoh Menkaure. He was a Pharaoh of the Fourth Dynasty. We are here in the middle of the old empire. It should be remembered that Egyptian antiquity has a history in several phases, taking place over several millennia. At the end of the Neolithic period, 6000 BC, began the pre-dynastic periods (-6000 to -3400), then arrived the protohistoric period (-3400 to -2900). It was only at its end that the dynasties were counted, starting from a new period called the Thinite Period (-3150 to -2650). The Thinite and Protohistory Period are the most often mixed up. The Thinite period sees the unification of the high and low Egypt and the establishment of a centralized administration on the pharaoh. Like then, around -2650, the old empire. The old empire lasted until 2200, when the central power, too weak, will break up into a multitude of local powers to remove the notion of territorial unity. This will be the "1st intermediate period". Then there was the middle Empire, a second intermediate period, then the new Empire, a third intermediate period, and we enter the low period, then in the times of antiquity as we know them: Greek period , Roman, Byzantine and Arabic. The pyramids of Egypt appeared on the basis of mastabas of the Thinite period. The first was Djoser, it was a step pyramid. 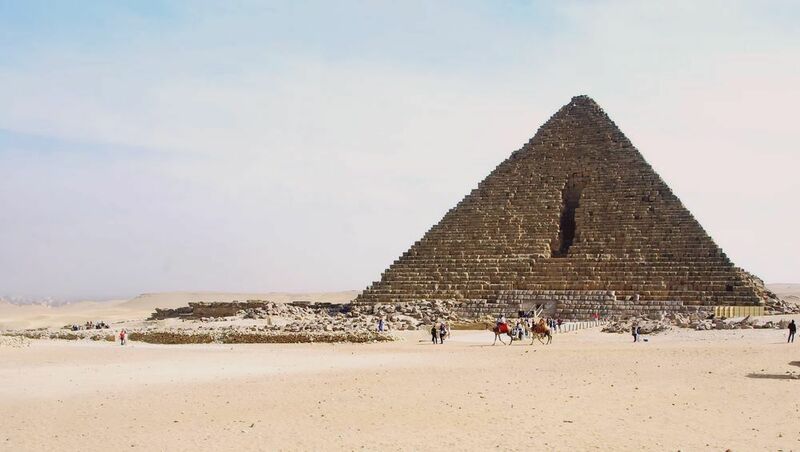 Then the architecture will evolve towards the pyramids with smooth faces, but not without difficulty: At the beginning of the Fourth Dynasty several attempts were made before reaching the first successful pyramid, the red pyramid of Snefrou. Then began the period of the giant pyramids, which ended with that of Menkaure, which represents the end of this period, with a pyramid much more modest than that of his father Khafra and his grandfather Khufu. It was in this historical context that the Menkaure pyramid was built. The pyramid of Menkaure was built in the Necropolis of Giza, southeast of the pyramid of his father, which was built in the south-east of that of his own father. This choice was not trivial. The pharaoh probably wanted to be in the family lineage, but we do not know the reason. For Lhafra, we know that there was an internal struggle for power, and that perhaps he was not the best person to govern, so he wanted to silence his detractors by placing his funeral complex at next to that of his father. But for Menkaure, there does not seem to have been such a problem that has arisen. Sometimes the pharaohs decided to settle near their fathers, sometimes in necropolises farther away. You should know that Giza was close to the capital Memphis. In the spiritual organization in ancient Egypt, the Sun is of paramount importance. Provider of life on Earth, he disappears every night to reappear every morning. This cycle was the focal point of many things in the organization of the country, starting with the urbanization of the country. Indeed, the region of the ancient Egyptians is crossed by the Nile. All that is east of the Nile, at the rising sun, is therefore dedicated to the world of the living. 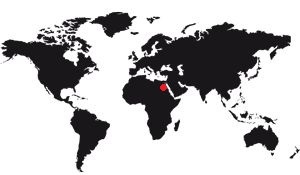 That's where the cities are. What is west of the river is dedicated to the world of the dead, for it is on the side of the setting sun: This is where the necropolises are. And if we look at a map, actually, the main necropolises in Egypt are on the left bank of the Nile. One must also know that at the time of the Old Kingdom, the geography of Egypt was not the same as today. If the climate was already very hot, the vegetation was much more important than what we know. The landscape was essentially savannah and no deserts. 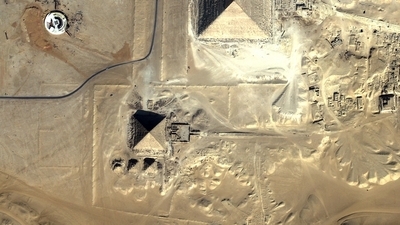 We must have this image in mind to better understand how were built the pyramids. 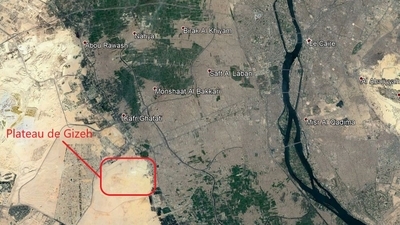 Learn more about the location of the plateau of Giza. Menkaure is also called Menkaure or Micerinos. The first name is Egyptian, the second is Greek. He was the son of Khafra and also decided to have his tomb built near that of his father and grandfather. Architecturally speaking, the funerary complex of Menkaure is no different from those of these predecessors. It is also composed of a central pyramid surrounded by a high wall, a high temple, a pavement, a low temple and ancillary pyramids, with the classical schema of a high temple attached to the pyramid, a pavement descending to to the low temple that served not only as a temple but also as a wharf. The entire Mykérinos funeral complex is located southwest of Khafra. The pyramid of Menkaure has several peculiarities. 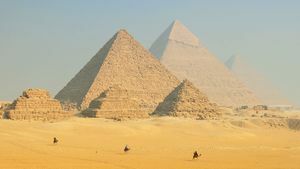 First, it's the premiere of a new pyramid series, closing the giant pyramids of its predecessors and announcing what will be the future pyramids of the pharaohs. Then, it contains many decorations on the front of palaces, an unpublished motif in a pyramid, all periods combined. These sets are geometric rectangles drawing false doors nested inside each other. It was a fairly common motif, it is found for example as a decoration of the wall of the funeral complex Khufu, built 50 years earlier. Another specificity, the internal structure of the funerary chamber, which will make school for the future pyramids. It is a model based on a rectangular burial chamber with a small corridor serving an annex room containing several stores, themselves containing Pharaoh's crowns and canopic jars containing the viscera of the body. This distribution had already been implemented at Khufu, but Mykérinos will make the first internal plan that will be reused by his successors. The causeway is also special since unlike the other two on the Giza plateau, the Mykérinos plateau does not join the two temples. The causeway does not start anywhere today, but probably a quay that disappeared at the time, it bypasses the lower temple by the west face before going up to the temple high. The Pyramid of Menkaure is 63m high at present, but at its construction it was 65m. 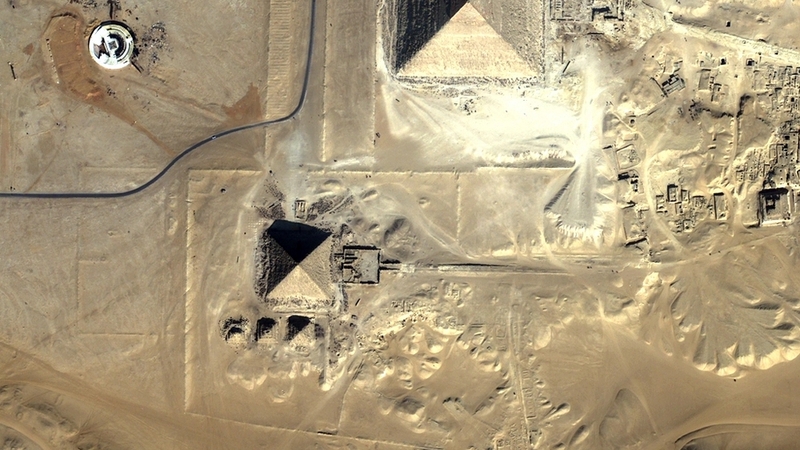 Its base is 105m square and its inclination is 51.20 °, quite close to a perfect pyramid. It rests on an unshaped ground, as for the pyramid of Khafra. That is to say, contrary to that of Khufu, for which the ground had been leveled before building the pyramid, the pyramids of its two predecessors were built on existing protuberances, to gain in number of blocks to carve. But this implies that you have to carve the ground to accommodate the first layers, to be sure that they are perfectly flat, a complex but necessary work. The massif was built in limestone blocks quarried from the Giza plateau, to avoid transport. Cut to the right size, they were brought and placed in horizontal layers whose flatness was close to perfection. The biggest blocks were at the bottom of the pyramid, and the higher you went, the closer they were. The Egyptians of the time did not wonder about the accuracy of the internal blocks. The equipment was coarse, with wide gaps. The blocks closest to the edges were finished with a little more care, and the interstices were thinner. 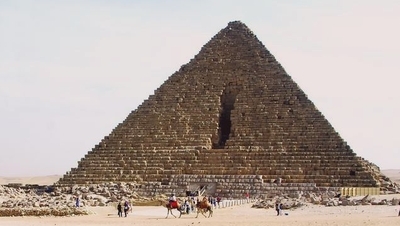 All the pyramid was covered with a layer of fine and white limestone of great precision in the finish, except on the lower part, on the bottom 20 meters, ie the first 16 rows, which were in pink granite. White limestone from the underground quarries of Tourah, an area nowadays included in the Cairo conurbation, east of the city. These quarries gave a white stone of great perfection, with a very fine grain. The stone was easily cut and gave the pyramid an impressive whiteness. But the first rows were pink granite, which came from the distant quarries of Aswan, in the south of the country. More difficult to cut, these stones were to ensure the strength of the siding while giving it a nice appearance. You must know that this pyramid has never been finished, there are several places in the funeral complex, which proves it. One of them is on the granite facing, since the stones were laid down and they were cut exactly on the spot. Now, on the granitic stones, there is a vertical line from which the stones are not yet finished. It also gives a clear idea of ​​how the ancient Egyptians worked, since we see that the stones were finished on the spot, after their poses. The north face of the pyramid of Menkaure has a very large vertical notch, in the center of the face. This is a breakthrough made in the Arab era by the Mamluk Sultan Osman Bey who lived in the twelfth century. He was trying to find the entrance to the pyramid based on the knowledge gained on the other two pyramids of Giza. Unfortunately, not only did he not find it, but he found no gallery. So, in the nineteenth century, the explorer R.W. Vyse decided to continue the breakthrough and prolonged it, hoping to find him too, but he arrived on the rocky plateau without more success. The explorer Caviglia himself blasted a few blocks to break through a gallery, but that did not help either. The entrance to the pyramid was hidden for a long time, it was only discovered in 1837 by explorer Vyse. It is four meters high, towards the center of the north face, near the great breakthrough of the twelfth century which was, moreover, passed right next to it. It opens onto a large corridor descending 32m long and leading to a room whose walls are covered with blocks of pink granite. The decoration is close to that of the palace facades of the time. Just after the room there are 3 stone harrows blocking the passage. Behind, the corridor continues to an anteroom of 14m long by 3m80 wide and 4m80 high. This antechamber is 6m below the pyramid, in the soil of the Giza plateau. It has a rectangular pit, placed in a niche, in which we found a sarcophagus engraved with the name of Menkaure, the Egyptian name of Menkaure. However it is a late sarcophagus, it is not the time of the construction of the pyramid. Above the access to this antechamber opens another gallery only 6m long, horizontally, and abruptly diagonal. But she is immediately stopped by a large block of masonry. The antechamber also has a ramp decorated with granite that leads to another horizontal corridor (going in front) or down stairs (going left). Opposite, we go to the burial chamber. The burial chamber is covered with granite blocks. It measures 6m60 by 2m60 for 3m40 in height and has a double slope ceiling that was lowered and rounded so as to believe in a vault. The sarcophagus of Menkaure was basalt, it was placed in the center of the room and was decorated with motifs on the front of the palace. In 1838 it was decided that it would be extracted from the pyramid for display in the United Kingdom. Nowadays, it would probably have been possible to contemplate it at the British Museum, if the boat that provided the transport had not sank in the golf of Cartagena, somewhere off the coast of Spain ... It is still there. If we take the stairs, at the ramp, we end up down 6 steps to arrive in a smaller room that includes 6 small storage rooms. It is thought that four of them, those at the bottom, could receive the canopic jars which contained the viscera of the pharaoh. The other two could have been used to store his crowns. Like the other pyramids on the Giza plateau, the Mykérinos plateau has a high wall that protected the pyramid. This wall was interrupted by the temple, the only point of passage to the edge of the tomb. And as the only passage in the high temple was the pavement and the low temple, it was necessary to go through the platform of the lower temple to reach the feet of the pyramid. Unfortunately, we do not have precise information on how this wall was built or how it was. The top temple of Menkaure has a peculiarity, it is not monobloc like the others. It seems to be, but it has an extra chapel that connects it to the pyramid, so you can not go around. The plan of this temple is relatively simple, compared to the plans of other high temples. Here, everything revolves around a rectangular inner courtyard accessible from the point of arrival of the roadway. The court possessed, like the temple of Khufu, two recesses, more and more narrow, on both sides of the court. The first recess was supported by four pillars, the second by two. There was a corridor on the north side, it served the rear of the temple consisting of various rooms to store the objects of worship to the deceased pharaoh during the years following his death in two stores. There was also a chapel to perform these rites, it overlooked a small open courtyard. The chapel contained a funerary stele used for worship, as well as a magnificent alabaster statue of Menkaure. During the reign of Shepseskaf, the successor of Mykérinos, an antechamber was added to the ensemble, probably because the existing one was too small to perform the cult. As usual, the temple was built with limestone quarried from nearby Giza quarries. The walls were covered with granite, for beauty and solidity. But the later added part was made of Tourah stones, this fine limestone for finishing, and adobe, a mixture of earth and plants. The access road is 608m long, it was a paved stone. At the early death of Menkaure it was not over. It was his son who added walls 2m high limestone, but it is unclear if there was a roof. This is probably the case because the other roads had one, but perhaps there was not enough time to do this work after the death of Pharaoh. This pavement has another peculiarity, it does not connect the two temples together. If she arrives at the temple high, she is content to circumvent the temple low on its west facade to end a little lower. It's a curiosity. The lower temple of the funerary complex of Mykérinos is at the same time different from the two other low temples but it is also very close to it. It's similar because the plan is very close to the Khafra grave, as well as in the dimensions, but it's far from it because it had to to be done after the death of Pharaoh, and therefore relatively quickly. The death of Menkaure occurred while the low temple was not finished yet. So it was his son Chepseskaf who finished it, using raw brick and rammed earth to finish it, just to go faster. But these materials are not adapted to cross the centuries, so there remains of the temple nowadays only the foundations and part of the basement, made of stone while the Pharaoh was still alive. But these foundations followed the old plan, which provided, as for the low temple of Khafra, a building with double entrances. At the front of the temple he built a small attached building that opens on two north and south corridors serving storage of offerings. The temple, he never saw build his double porch courtyard, he was preferred a simple square court quick to do. This courtyard had, all along the walls, niches intended to receive small statues. The rear part of the temple is slightly elevated, it is a set of corridors serving storage rooms of worship materials and offerings. These rooms have access to the road via a door on the south side. The last is unknown because the statue is fragmentary. Recall that a name was a region administered by Pharaoh. Also found in the lower temple is a representation of Menkaure and his wife Khmerernebty, as well as various other small statues, often severely damaged. The tomb of Menkaure has three annex pyramids along its southern face. They are coded G3a, G3b and G3c (G for Giza, 3 for the 3rd pyramid, the letter identifying the Pyramid from East to West). The first is a smooth-faced pyramid while the other two are at degrees. All three have a small temple on their eastern side facing the east. 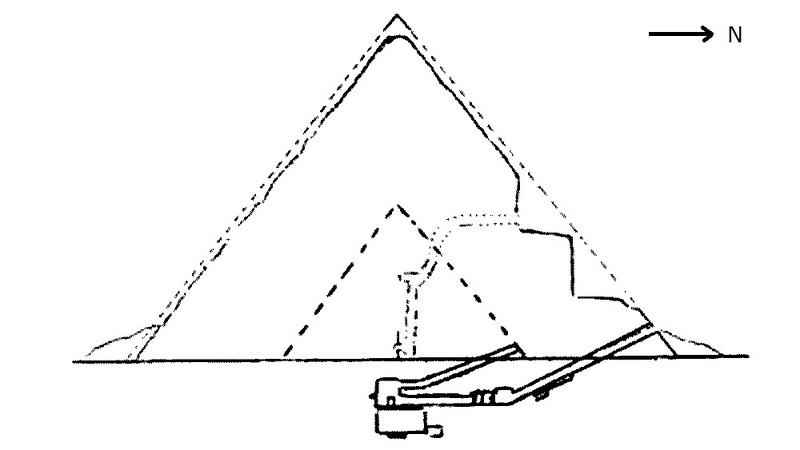 The First Annex Pyramid measured 28m high for a 44m square base. It was a smooth-faced pyramid with a coating of limestone Tourah no longer exists. Its entrance is on the North face, it allows to discover a downhill gallery, then going horizontally to a burial chamber where a large granite sarcophagus has been found. This pyramid was accompanied by a small funeral complex consisting of a courtyard and a temple facing east and containing various storage rooms. It seems that this pyramid is a small-scale reproduction of the tomb of the pharaoh. Since it houses a sarcophagus and there is a temple, we imagine that it is a grave. The second and third pyramids are similar. These are four-degree pyramids, lower than the first, and each with a small, narrow temple facing north. Their entrances are on the north face and leads to a gallery descending directly to a burial chamber. The second pyramid offered an unidentifiable granite sarcophagus, but containing a skeleton of a young woman. If we have no idea of ​​the identity of this person, a mention in the burial chamber tells us that this pyramid was planned from the design of the complex, it is not an addition. Of course, it is the weather that has most deteriorated the funerary complex of Mykérinos. Gradually, the stones were degraded, the wooden parts fell to dust and all the buildings eventually fell into ruin. But human action must not be underestimated, which is ultimately the greatest destructive force of the remnants of Giza. 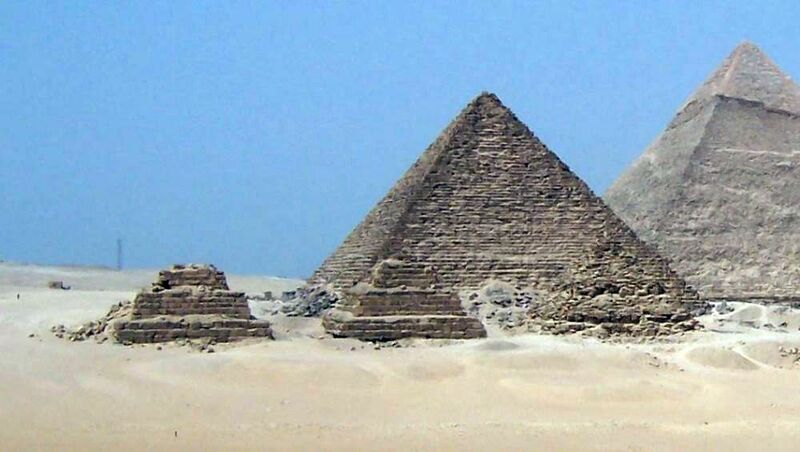 Indeed, if the stones of Tourah, so white, disappeared from the facing of the pyramid of Menkaure, it is above all because the quarrymen of the Antiquity, then of the Middle Ages, were used. Indeed, why bother to cut the rock when tons of unnecessary stones are available at will, some already perfectly cut and abraded? Gradually the stones of the siding were reused, and in parallel it was also the case of the stones of the temples, the granite slabs, etc. The site is therefore degraded essentially at this time. In the 19th century the explorer Vyse prolonged the breakthrough more deeply, but still without success.